LESSON 3: Who's got the time? LESSON 6: Which coin is which? LESSON 8: Show me the Money! SWBAT label a clock in 5 minute intervals. SWBAT tell time to the 5 minutes. Integrate spring themes, joy AND rigorous practice on telling time in this lesson! Students will create a flower clock using what they understand about time to the 5 minutes. Great for 1st or 2nd grade! In first grade, students are expected to tell time to the hour and half hour. In second grade, the CCSS asks students to tell time to the 5 minutes. This lesson bridges the first and second grade standard by having students discuss WHY we count by 5 minutes, and WHY we say 30 on the half hour. Students will create a flower clock to use during this lesson. They will be able to use this clock over multiple lessons, and doing a craftivity every now and then helps keep Spring Fever from running rampant! We have worked on telling time before. Today we are going to talk about why we count by 5s with the minute hand. You are going to get to create a clock to use where you show how to count by 5s for the minute hand! We use time in the real world. We have to see what time it is so we know if its time for math or for reading or for recess. We have to keep track of how much time is passed so we finish everything in the amount of time we have planned for it. Your thinking job is: Why do we count by 5s? I will have a large clock drawn on poster board in the center of the rug. It doesn't need hands right now, it just needs the numbers on the clock face. Quick Review: One of the trickiest parts of telling time is when the hour hand is between two numbers. To help students remember to go back to the previous number, another brilliant teacher one time told me how she does the Lean Back mnemonic. You can see how we used this in a previous lesson in this video reflection! We will quickly review telling time using the hour hand only. The key point with "Lean Back" is that students understand the hour hand hasn't gotten to the next hour yet. Minute Hand: Most of my students will remember that we count by 5s to tell the time. During this part of the lesson, we are going to figure out why. Refer to poster clock: All of these numbers divide our clock into sections. In each of these sections there are 5 minutes. If the minute hand is between these numbers, it is just pointing to one of the minutes that are inside there. Present task: I am going to pretend that each of these cubes represents one minute. We are going to show how many minutes are in each section of our clock. 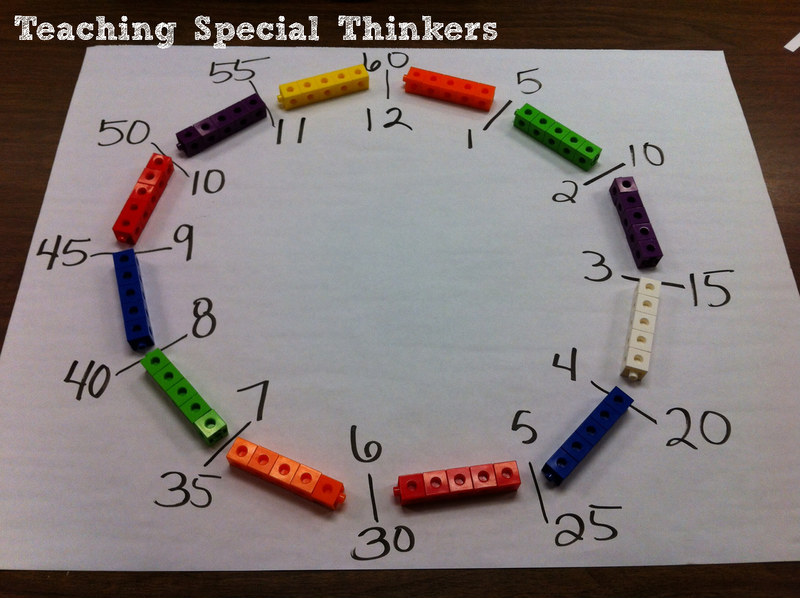 As a class, we will construct a clock like this one from the Teaching Special Thinkers blog. We will put 5 cubes between every number to represent the 5 minutes in that section of the clock. You can see how our's turned out in the attached picture! Why do we count each of these sections by 5? Why not 10s or 2s? This question gets at the reasoning behind skip counting. Students understand that in order to count by 10s, they must have groups of 10. Likewise, in order to count by 5s, they need to have groups of 5. Why do we say 30 minutes when we get to the 6? Could I count the cubes individually by ones and still get to 30? Let's test to make sure. Present task: Now you are going to make sure you can show how to count by 5s around a clock. To do that, you are going to create a springtime flower clock. You have to show how to put the flower petals in order around your clock. Directions: Use the materials you can get for free at Jen K's Teachers Pay Teachers store. I'll print all of the materials onto card stock so they stand the "test of time" better! Who doesn't love puns?! 1. Cut out the clock face and glue onto a paper plate. 2. Cut out the flower petals. 3. Glue the petals (:00, :05, :10, etc) behind the correct number on the clock face. You might draw a dot on the side you want kids to glue. Otherwise they will glue the actual times under the paper plate and you won't be able to see how they counted! 4. If time, make a stem out of green posterboard. 5. Add hands to the clock using brads. Students work on making the clock for 15-20 minutes. Common Misconceptions and How to Handle Them! Students use their flower clocks to practice telling time using this Spring Time worksheet. Students make the flower clock match the clock on the practice sheet; this helps ensure that they are really paying attention to where the small hand vs. the big hand is. Then students write the matching time. Group A (Intervention): Students work only on hour and half hour. Group B: Student worksheets have blank clock faces so the teacher can draw hands on the clock to match the level students are ready for. My plan is to draw in any time to the 5 minutes. Listen to a child in this group explain how her flower clock works-you'll especially love how she explains why we can't count by 10s! See the attached Flower Clock Explanation video! Because this is the first lesson in the unit, I won't have a Group C (extension) group. Incorporate technology and play this fun Early Math: Clock Shoot game. I am going to project it onto my promethean board. If you have a projector only, change the game where kids get whiteboards and have to write down the time quickly. First kid who shows it each time can come and click the time on the computer!